At The Web Development Group, we specialize in building custom WordPress and Drupal websites that are guaranteed to please visitors. There is a lot that goes in to each website we launch. From the beginning research phase where we meet with clients and discuss the goals of the new site to content management where we help build a site that is not only SEO friendly but pushes out appropriate content to the audience. During last year’s GiveBack DC, we worked with one nonprofit, DC Diaper Bank, that had a clear vision for where they wanted their nonprofit to go. We focused on designing their website to be appealing to a broad range of audiences: parents looking for diapers, visitors eager to donate left over diapers, and the general public looking to contribute money to the organization. Because so much of the site focuses on encouraging visitors to take action, either through donation, or retrieving diapers, it was important that the website was built in a way that places calls to action throughout the site in an aesthetically pleasing way. DC Diaper Bank had specifically requested that their site not look too “babyish” as a result, we stayed away from pale pinks and blues. The majority of the site is beige with green and blue accents throughout. The site also features multiple infographics, a meter that counts the number of diapers donated, and social media buttons. The Web Development Group also focuses on creating custom responsive designs for the websites we build. 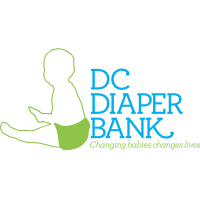 DC Diaper Bank can be viewed optimally from any mobile or tablet device allowing visitors to check on diaper distribution centers while they are on the go. Like all sites we build, we wanted this to be a web design success story. So how do we measure the success of a single website we launch? There are a few ways. One is to check Google Analytics and see how visits, time spent on the site, and pageviews have changed. A successful web design will help build legitimacy for the organization and improve donations. So, how did DC Diaper Bank fair on these tests? They saw a 121% increase in visitors to the site, a 103% increase in pageviews and an increase of 23% on average time spent on the site. Needless to say, this was seen as a successful web design. Another way to measure success is from feedback from the rest of the web design and development community. You cannot imagine how thrilled we were when DC Diaper Bank appeared on WordPress’s Showcase. Not only that, it has the highest rating of all time. Check it out and vote it up! The Web Development Group is an Alexandria based DC design and development firm. We focus on building modern, dynamic Drupal and WordPress sites for the DC , Maryland, and Virginia areas. Our team of dedicated DC web designers will blow you away with their creative and skill. Get in touch with us today to learn how we can help build you a showcase worthy website.